I am working on a problem for an online class that I'm struggling to figure out. The desired conclusion is ~H. My hunch tells me I need to use negation introduction on premises 2 and 3 to derive ~~A and ~~B, from which point I can use negation elimination to derive A and B. Does anyone have an idea of how to approach this? Edit: Here is what I have so far. From 2 we have ~K. Putting it to 3 we have A. Now let's assume A > B. From 2 we have ~B. Therefore, if A > B then ~A. For simplicity, let us use new variable C to denote A > B. Thus, C is false and we conclude ~H. H thus (A thus B). Premise. If (A thus B) is false, then not-H is true, by modus tollens. So proving not-H is our goal. Do the premises show that (A thus B) is false? 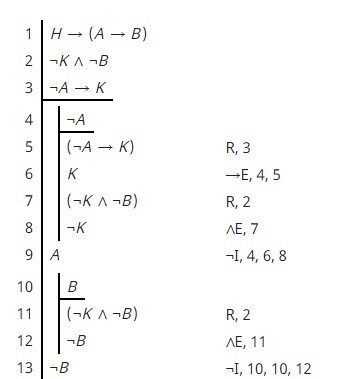 (A thus B) means (not-A or B). Equivalence. The denial of (not-A or B) is (not-(not-A or B)). (not-(not-A or B)) means (A and not-B). Equivalence. Thus (A and not-B) is what we must show to be true. 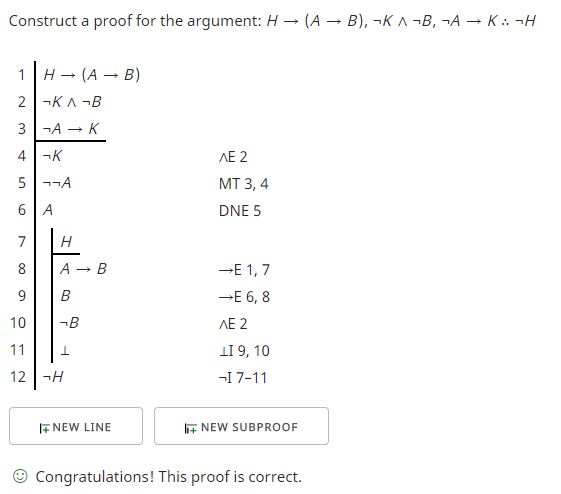 Proof of this relation will negate H.
A is true. By modus tollens, as (not-A thus K) is the premise, but not-K is true. (A and not-B). Adjunction. Thus the negation of (A thus B) has been shown.